A non-profit corporation whose purpose is to promote and maintain public and scientific interest and research in bromeliads throughout the world. There are 4 classes of membership: Annual $10.00; Sustaining $15.00; Fellowship $25.00; and Life $200.00. All memberships start with January of the current year. 1977-1980: William Kirker, Leslie Walker, Eloise Beach, Fritz Kubisch, W.R. Paylen, Amy Jean Gilmartin, Edgar Smith, Thelma O'Reilly. 1978-1981: Jeanne Woodbury, Ervin Wurthmann, Victoria Padilla, David H. Benzing, Louis Wilson, Joseph F. Carrone, Jr., Timothy A. Calamari, Jr., Roger Vandermeer. 1980-1982: Doris Curry, Morris Dexter, Sue Gardner, Tim Lorman, Valerie Steckler, Harold W. Wiedman, Charles Wiley, Dale Williams. Why Do Some Bromeliads Never Flower? Office: 647 S. Saltair Ave., Los Angeles, CA 90049. On our trip to Northern Peru in 1975 we collected between Progress and the Campamento Garcilla, beside the new road Ingenio-Tarapoto (Dptm. Amazonas) a new, interesting Guzmania. I dedicated it in honor of Victoria Padilla, the editor of the Bromeliad Society, for her work concerning the bromeliads. 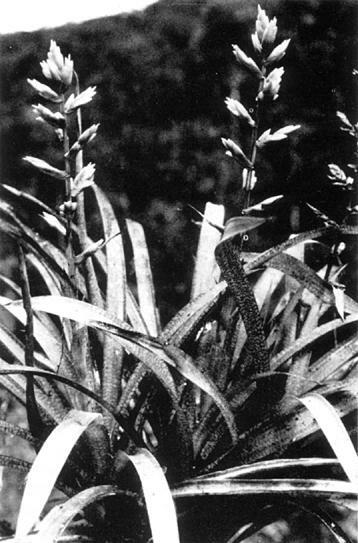 G. victoriae, first published in "Tropische und Subtropische Pflanzenwelt", Bromelienstudien, 6, 1976, p. 354-357, grows terrestrially in a dark, humid mist forest, rich in mosses, in association with a probably new Greigia. Although the plant receives only few hours of daylight, it shows a striking colour of the leaves, bracts and flowers. In nature the leaves are yellow-green and provided with fine dark-red hieroglyphic lines. G. victoriae has a long creeping stem up to 80 cm long, covered with the dead leaves. The living ones form a rosette up to 40 cm in diameter; the sheathes are inconspicuous, up to 7 cm long and 3 cm broad, at the base dark wine-red stripes, with hieroglyphic lines beneath; blades subligulate, up to 30 cm long and 2 cm wide, acute, yellow-green, with wine-red crosslines; in cultivation green, glabrous above, sparsely lepidote beneath, scape erect, thin, glabrous, carmine-red; scape bracts imbricate, longer than the internodes, the basal ones subfoliate, the upper ones with a long, yellow, red striped sheath and a short, reddish blade; inflorescence mostly lax-tripinnate, narrow pyramidate, up to 50 cm long and 10 cm wide; axis angled, glabrous, zinnoberred, with 8-10, horizontally spreading branches; primary bracts 4-1 cm long, shorter than the spikes, the basal ones yellowish-green and red nerved, the upper ones red and yellow tipped; spikes short stipitated, complanate, at first dense, at anthesis lax and the red axis visible, up to 4 cm long and 1,5 cm wide, with 6-8 flowers; floral bracts distichous arranged, ecarinate, even, red, yellowish at the tip, longer than the sepals; these up to 1,5 cm long, yellow, the posterior ones inconspicuous, carinate, 5 mm high connate, yellow, glabrous, sparsely lepidote, petals 2,5 cm long, connate up to 2 cm, the free lobes obtuse and recurved; stamens and style included; the filaments attached to the petals up to the free lobes. Holotype: RAUH Nr. 38 336, Sept. 1975. This decorative species differs from a typical Guzmania insofar as the flowers are not polystichous but distichous arranged. But in cultivation they show more and more the tendency to a polystichous arrangement. G. victoriae must be cultivated — according to its habitat — humid and cool. Under these conditions it grows very easy and flowers every year. Our president is a native Californian, having received his degree in ornamental horticulture from the California State Polytechnic University in San Luis Obispo. A personable young man, his youth belies his great knowledge of all things horticultural and the enthusiasm he has for them. Needless to say, his greatest love has become bromeliads. Mr. Lorman is a member of the staff of the Los Angeles State and County Arboretum in Arcadia, California. He is the chief horticulturist, specializing in rare tropical plants and is in charge of the 23 greenhouses on the grounds as well as the special display area. He also supervises the nursery where are grown many rare plants which have been received from over 400 botanical gardens throughout the world. Their value to the California landscape and their adaptability to the climate are here assessed, and if found desirable, seedlings are sent to wholesale nurseries for distribution. The cultivar known as Ae. orlandiana 'Ensign' is indeed a beautiful plant! It is unique among variegated aechmeas in being bizarrely marked throughout both the green tissue and the white. It is my understanding that it popped up as a single individual among a group of normal seedlings of Ae. orlandiana. Can you imagine the excitement and anticipation this little variegated plant must have generated as it began to develop not only characteristic Ae. orlandiana shape and markings, but also pink and rose color within its white marginal areas! During the first several years after its release to the public, divisions sold for a hundred dollars and more each — a very tidy sum for a plant whose individual growing characteristics were still virtually unknown. But, this did not seem to matter. Everyone knew and liked the normal form of this species and, therefore, had to have this exciting, new form. It was snapped up by commercial men and hobbyists alike. From here on, in the hands of these persons, some seemingly strange things began to happen. Now, it must be understood that the pattern in variegated plants may be stable, meaning that it will come true or repeat itself exactly in offsets; or it may be unstable. Further, it may be stable only some of the times! And this latter condition is what has prevailed in Ae. orlandiana 'Ensign'. 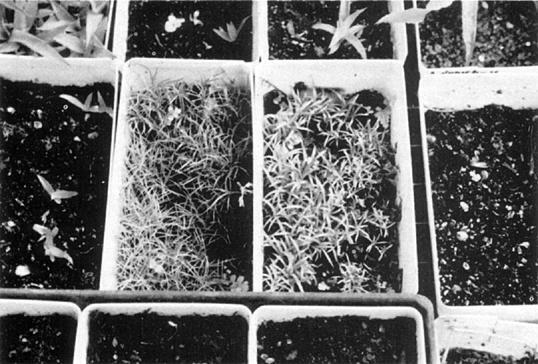 Extensive and long-termed vegetative propagation began to give rise to mutations that, in almost every instance, have been inferior to the original plant. Permit me to explain the manner in which most of these mutations have come about. Bear in mind, though, that the original Ae. orlandiana 'Ensign' is itself a mutation or sport, to use the term loosely, that was derived from seed. In this cultivar, as in all variegated plants, there are two types of plant tissues, tissues of distinctly different genetic constitution. For example, there is green tissue showing the presence of food-manufacturing chlorophyll, and there is the variegated or albinistic tissue in which there is an absence of chlorophyll. All such plants with two distinct types of tissues are referred to as "chimeras". However, chimeras are not limited only to these two types of tissues in a single plant. For example, a plant having both diploid and tetraploid tissues is also a chimera. In fact, there may be numerous combinations of plant tissue types, all of which are referred to as chimeras. But, for this article, permit me to limit the definition of a chimera to that small area comprising the variegated plants. Let's focus our attention on a cross-sectional view of the stem of such a plant. Close examination would reveal a very thin ring of albinistic (white) or variegated tissue all around the edge, while the central portion of the stem shows up as green. This view represents the first of the three kinds of chimeras known as the periclinal chimera. Vegetative buds or pups resulting from such an area on a stem will give rise to a stable individual that ought to look like the original. As long as any cross-sectional view of the stem remains in this configuration, a plant of stable variegation can result from dormant buds situated anywhere along the stem. 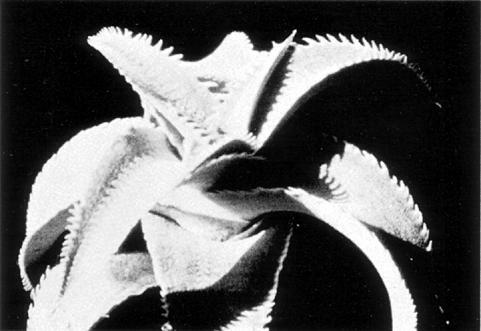 It is when this configuration on the stem changes or deteriorates, for one reason or another, that changes will occur in the symmetry of the variegated plant and in the pups produced. Just why some of these changes in configuration occur is, for the most part, still a matter of conjecture. A second kind of chimera is known as the mericlinal chimera. In this situation a cross-sectional view of the stem would reveal that, except for a small segment layer of variegated tissue situated on or just beneath the outer skin, nearly all of the epidermal and inner stem tissue is green. As a consequence of this situation, very limited variegation can occur in the total plant or in a pup that might form from an axillary bud along the stem. The reason for this can readily be understood when we realize that, although we see vegetative buds as lying along the outer surface of a stem; in reality, they are deeply seated in the stem. As such buds become active to form a new plant, not only is the outer stem area contributing in the growth process, much of the internal tissue of the stem is also being duplicated for pup development. The third kind of chimera is called a sectorial chimera. In this situation a cross-sectional view of the stem would reveal the variegated tissue in a configuration somewhat remindful of a wedge cut out of a pie. Not only is the variegated area confined to the edge of the stem (corresponding to the perimeter of the cross-sectional piece of stem in view), but also it is evident in some of the underlying tissue, the inner-stem area. In this kind of chimera the plant seems to be divided into sections, part with normal green tissue and part with the variegated tissue. Here again, the inner-stem tissue being sectored in the manner described, contributes to, and, therefore, influences the overall pattern of variegation in the plant and in all pups resulting from such tissue. Neither the mericlinal nor the sectorial chimeras can any longer be considered identical to the original. Propagations resulting from such plants may never be identical to the original either. They ought not be called Ae. orlandiana 'Ensign' any longer, simply because their genetic constitution — the arrangement of their genetic material — has changed! In short, they have mutated further; they have degenerated; and they have become inferior to the plant we know as Ae. orlandiana 'Ensign'. The only propagations of this plant that can rightfully be called Ae. orlandiana 'Ensign' are those that continue to remain true to the original — those that result from periclinal tissue. And, going a bit further, these are the only propagations that deserve to be sold under the original name. All distorted propagations ought not command a price anywhere near the proper forms. In fact, I wonder why anyone would be interested in such distorted plants at all unless he merely wanted to experiment in an attempt to recover something worthwhile from them. Well, perhaps the truth is that there has been an unsuspecting public — hobbyists and commercial people alike — who were totally unaware that anything was so wrong with these less-than-normal forms. It is unlikely that the original type could be recovered in subsequent growth from some of the chimeral forms that I have seen in various private collections. Several years ago I purchased a division of Ae. orlandiana 'Ensign' from Mr. Kelsey Williams for my wife, Susan. It was a true-to-type division. Though I did not know very much about Ae. orlandiana 'Ensign' at the time, everyone remarked how large and strong her plant was. The leaves held their position well, the lower and middle ones did not droop as so many do, and the green area in the leaves was centrally located in every leaf. In short, it was a very nice division. Through the years propagations from it have remained stable, and I have removed as many as five and six one-third-grown pups from several divisions — all from the single ramet purchased years ago. Well, what do the mutated forms from Ae. orlandiana 'Ensign' look like? For the most part, many can be spotted immediately by their lack of balance in the variegation as you look down onto them from directly above. If one side or section of a plant has a disproportionate amount of either white or green, the division is more than likely degenerating. If several leaves to one side of the plant do not show the green tissue centrally, but, instead, some leaf blades are divided green on one edge while white on the other; then such plant may be degenerating. A third type of degenerative mutation is exhibited by the center of the plant going all white, or all green. Two additional mutated forms are found popping up, also: they are the totally green plant with no variegation whatsoever, and the totally white or albinistic plant. Now, these two latter forms can no longer be called chimeras, since they do not possess two types of tissue, though they may come from a parent that is a chimera, and, more than likely, a sectorial chimera. They result from buds on the stem of the mother plant where there is a total absence of one or the other type of chimeral tissue. I would remove and discard all such pups just as soon as it could be determined that they will not develop into the normal type. In this way the strength of the mother would go immediately into production of more pups, and, hopefully, one or more will come from an area along the stem that had normal variegation so they could be true to the original. I have also seen some very narrow-leaved and thin-stemmed forms of Ae. orlandiana 'Ensign' that were normal in their variegation pattern. Unless this stunted appearance is the result of a further mutation, a debilitating sickness, a virus or the like, that I am not familiar with; I suggest that these poor-looking plants may just be starving in a very poor growing medium. I should like to see them shifted into a richer compost or into osmunda, or fed properly to determine whether they could become more vigorous. Frequently I am asked whether pups will come true to the mother plant. Theoretically, since a pup is a vegetative extension of the mother plant, it ought to be identical to the mother in its genetic constitution. Well, from the above discourse on the many mutations of Ae. orlandiana 'Ensign', one can see that such is not necessarily true, since much depends on the plant involved. Even where the mother plant is not a chimera, mutations may occur. They may be brought on by variations in environmental and cultural conditions, chemical treatment, radiation, insect vectors, and still other things. While the great majority of mutations that have occurred in Ae. orlandiana 'Ensign' have been degenerative and inferior to the original, let me point out that a great many mutations among horticultural crops of all kinds have been superior to many originals or at least as fine. Since I have covered the degenerative mutations of Ae. orlandiana 'Ensign' pretty thoroughly in order that everyone might be more cautious about the purchase, propagation, and exchange of all such plants; I feel that it is only fitting to say that there is a form in reverse to the original Ae. orlandiana 'Ensign', whose leaf edges are green and the white band is central in the leaves. Though I have not seen it, and, therefore, would not care to endorse it; I hope that it proves to be reasonably stable, and that it is a willing grower. Note: this article constitutes an application of a concept adapted from W. N. Jones in the "Botanical Review" 3-545-562, 1937. Contributions are still being gratefully accepted for The Mulford Foster Memorial Fund which aids the Bromeliad Identification Center at the Marie Selby Botanical Garden in Sarasota, Florida. Affiliates especially are urged to donate to this worthy fund. The three most recent donations were from Mr. Joseph E. Weber, Ohio; Shreveport Regional Bromeliad Society, Louisiana; and the South Bay Bromeliad Associates, California. The address is Mulford Foster Memorial Fund, 846 North Irma Avenue, Orlando, Florida 32803. 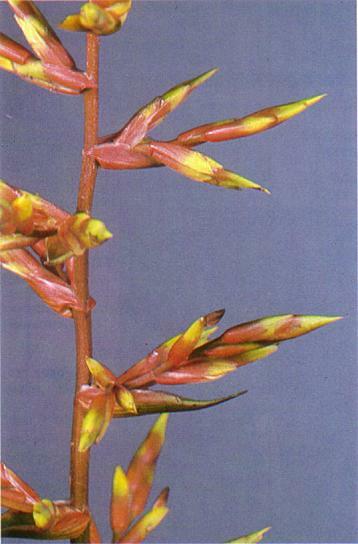 Well grown plants of Tillandsia albida should flower when 40 to 60 cm long and produce 3 to 5 offsets spontaneously, high on the plant, just below the base of the flower stem. The yield of offsets can be increased by sectioning this stem. Cut the plant approximately in half, and the lower (oldest) portion in half again. Hang the sections (youngest end up) and fertilize normally. The offsets can be removed when 3-5 cm long, but I prefer to let them get a little larger. If the sections are robust, a second and possibly a third round of offsets can be harvested. Continue fertilizing the sections until the old leaves and stem dry off. Plants which have grown very long without flowering can also be sectioned for offsets. Leave 40-50 cm of the youngest part of the plant, cut the rest into 12-15 cm lengths and treat as above. Any section with functioning leaves is a potential source of offsets. I prefer to mount T. albida, and since it rarely forms roots, I tie it to a stick and hang it from the roof of the bush house where it gets strong light (about 40% shading) and good air movement. T. albida responds very well to regular dipping or spraying with weak fertilizer. I used this same technique with T. tenuifolia var saxicola and T. duratii var. saxatilis, and it was a complete failure in both cases. The old sections dried up with no suggestion of offsetting, and I have not had the opportunity to experiment on other caulescent tillandsias. Although I have been raising bromeliads for over thirty years, I find that I am constantly having to change my growing techniques. First of all, I kill too many plants with kindness — if I would just leave them alone they would do better. An example of this is the loss of my Dyckia marnier-lapostollei, which I mothered to death. I took loving care of my Aechmea fendleri, but it refused to do anything. So I took the plant and put in into the garden without any special soil or attention. It immediately thanked me by sending out two magnificent inflorescences — that measured 18 inches in length and 4 inches in width. Southern California sun in late summer can be hot. This past year my plants not only were bleached out, but they were burnt, even in the lath house. Saran cloth seems to bring out the best coloration. I am dubious about many of the variegated varieties. Cryptanthus 'Elaine' lost its pink margins just after two months. A very handsome specimen of Aechmea orlandiana 'Ensign' bloomed and was a sight to behold, but its pups have all been white and the plant appears to be dying. Many of the neoregelias which I purchased that were reputed to be small plants all grew to a great size — the only exception being Coolbaugh's "Beta" and "Little Cherub." A favorite of mine is the miniature form of Neoregelia meyendorfii 'Albomarginata,' probably a form of carolinae. It seldom exceeds 12 inches in width and the foliage is elegantly striated. It is a robust little plant. An objective of the writer in preparing this series of articles on the various phytohormones has been to stimulate experimentation by suggesting various ways in which these substances might be used in the propagation and growing of bromeliads. The substance which we shall presently discuss is unstable and present in exceedingly minute quantities. We do not expect that it will be available in vials from chemical companies for practical use. However, all those who give plants artificial photoperiods or who change the spectral composition of light drastically are influencing the form and amount of phytochrome. Therefore, we believe that an understanding of a few of the fundamentals of this very complex subject is worthwhile. Phytochrome is a receptor for the red and far red bands of the spectrum. Some other light bands also have photomorphogenic effects on plants and there are other light receptors. Some facts are known about another photomorphogenically active blue light receptor system which possibly involves a flavoprotein as a receptor. However, this field of experimentation is still so undeveloped that we shall not discuss it. However, several books have been written about phytochrome and several international symposia have been held. The discovery of this substance is undoubtedly one of the most brilliant achievements of team research in plant physiology in recent years. The writer started to attend the meetings of the national scientific societies in 1930. During that decade, the writer often listened to papers by a brilliant young plant physicist and physiologist, Dr. Robert Withrow. I remember that he predicted that a pigment would be found in plants which is involved with photoperiod responses and he described some of the characteristics which it would have. I once discussed his statements with a very noted plant physiologist who was then a member of the laboratory which later discovered phytochrome and he laughed and told me that Withrow was a dreamer! Dr. Withrow and his wife, also a scientist, were located at Purdue University. They were using light filters of all kinds in connection with their studies of photoperiod. Dr. Withrow died suddenly, very young, but his wife carried on some of his lines of investigation. I have often wondered if Dr. Withrow would have made the discovery if he had lived. He was undoubtedly a most gifted and brilliant person, but I doubt if he would have beaten the United States Department of Agriculture group, since they had some unique equipment which gave them a great advantage. Just before National Prohibition was enacted, an elaborate oenological laboratory was built at Beltsville, Maryland. It was never used for the purpose. The fermentation room was long and narrow, but the vats and casks were never installed. Dr. Borthwick installed a very powerful arc lamp movie projector from a theater in Washington, D.C. at one end of the room. The beam was projected through a giant prism and the spectrum was displayed on the wall on the other end. Experimental plants were grown in any desired wavelength of powerful light for any desired photoperiod. This set-up was vastly more efficient and flexible than the filters used by the Withrows, and I believe that it had much to do with the discovery of phytochrome. The group which made the breakthrough was headed by Dr. S. B. Hendricks, who was a physicist working with soils when I first met him. Soil scientists do much plant experimentation, but I do not know the circumstances which led him to become involved in research with light. Just before this, several scientists in the Smithsonian Institution had studied the light sensitivity of lettuce seed. After it has been moistened, germination is promoted by red light. However, germination can be stopped by exposure to far red light, most of which is invisible to the human eye. This process can be reversed at will, according to the quality of the light in the last exposure. For a time, the Tooles, a husband and wife team, were involved with the studies which led to the discovery of phytochrome. Movements of chloroplasts in cells. Phytochrome has been detected in most, if not all, plants. Plants grown in darkness have more of it than those grown in the light since there is a continuous dissipation of the Pfr form. Another interesting relationship is that the electrical charges of root or coleoptile cells become more positive with exposure to red light. These changes can be very rapid and are paralleled by alternations in the membranes to potassium ions. Both Pr, which absorbs red light, and Pfr, which absorbs far red light, are present at the same time in plant tissues. The ratio of the two forms determines the direction of the response, which depends on the spectral balance of the light. Red light transforms Pr to Pfr and vice versa in response to far red light. Pfr is slowly destroyed and replaced by Pr in darkness. This mechanism is indirectly involved in photoperiodic treatments to control flowering and for a time the Beltsville group believed that phytochrome was the hormone of flowering. However, this was soon disproved. Nevertheless, there is still very strong experimental evidence for the existence of one or more still unknown hormones which control flowering in some plants. Bromeliads tend to have somewhat predictable flowering periods and day length is undoubtedly a factor in floral initiation. Little information is available on phytochrome in bromeliads, but we may assume that it is present and that it regulates a number of plant processes. Our present knowledge of phytochrome is incomplete, but much experimentation is in progress in various research centers. We append a list of several excellent recent books for those who wish to pursue the subject further. Smith, Harry. 1975. Phytochrome and Photomorphogenesis. An introduction to the Photocontrol of Plant Development. 235 pp. McGraw Hill. N.Y.
Smith, Harry. editor. 1976. Light and Plant Development. 516 pp. Butterworth. London. Vince-Prue, Daphne. 1975. Photoperiodism in Plants. McGraw Hill. N.Y.
GEORGIA BROMELIAD SHOW — The second annual Georgia Bromeliad Show will be held in Atlanta on Saturday and Sunday July 12 and 13. The location will be Northlake Mall, located on LaVista Road, just inside Interstate 285. The show will be staged by the Atlanta Bromeliad Society, Inc., a group of enthusiastic and fine growers numbering over 80 members. This Society, organized in 1974, is to be congratulated for the great progress it has made in the past six years of its existence. D. Smit with bromeliads in Show House. Since the inception of the new botanical gardens of the Free University located near the old Olympic Stadium in Amsterdam, we have striven for a collection of bromeliads to assist the students in biology in their studies. 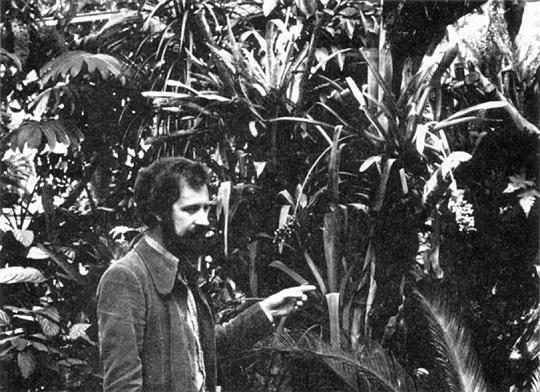 At this time, we do not have a very large collection of the Bromeliaceae; we grow only the genera that we deem important for the students in the biology department. However, we do have an extensive collection of terrestrial bromeliads such as dyckias, hechtias, deuterocohnias, puyas, etc., which are grown outside during May through October. For the rest of the year, they are kept in a hot house at 5 °C temperature. Tillandsias are grown outdoors in summer in Holland. The largest group of bromeliads are the tillandsias, which are kept in two separate greenhouses. They are grown as epiphytes and are mainly mounted on tree stumps and on drift wood. They are grown outside during the summer — from May to October — in full sunlight and are in excellent condition. Because of this method and bi-weekly feedings, you will find that our tillandsias attain a beautiful coloration. Our over-abundance of mounted tillandsias is certainly an eye stopper to our many visitors. There is a great variety of bromeliads in the main greenhouse — here we use many colorful cryptanthus as ground covers. The greenhouses are open to the public on weekdays from 8 to 5:30. We are always willing to exchange plants with serious hobbyists. For that purpose we have available a catalogue of our plants. This is a sixty-four dollar question from California. Actually, of course, all bromeliads do flower, even if it takes them 150 years to attain that achievement, as in the case of Puya raimondii. Most of us would prefer not to wait 150 years and so become impatient when some of the species do not flower. One of the most provoking experiences is that certain species seem to flower regularly for one person or in one section of the country, yet, that same species may rarely ever flower in another area. Of course, there is a reason but we are not able to explain it. There are so many conditions that enter into this problem that no one can give the specific reason in each case. We do know, however, that some species are much more tolerant than others to different growing conditions, such as light and temperature, and this problem often becomes one of local conditions that enter into this problem. Certainly, the water question is an important one and rain water is unquestionably the best, although not always easily obtainable. Water on the neutral to acid side is the best, however, many aechmeas, neoregelias, billbergias, etc. will tolerate water slightly on the alkaline side. Vrieseas certainly want acid water and the ones that do best with me are those that I put outside in a shade house where they receive plenty of rain. Also, I always pot vrieseas in osmunda alone, and almost all other bromeliads in an acid medium such as leaf-mold, german peat, osmunda and sand. I think that osmunda could be used for practically all bromeliads but it should not be allowed to break down to a soggy "sweet" mass. Look and feel the texture of your plants. If the leaves are stiff, spiny, spotted or covered with gray tomentose scales they will most likely need much light and air. If the leaves are glossy and thin as with most vrieseas they will need more syringing, shade and protection from too many air currents. Light hours, cool temperatures, dry spells, rainy moist seasons are all natural causes for having normal flowering seasons for the different species. However, any one of these conditions along with the improper chemical content of water or food may cause the plant to continue to grow year after year, produce offsets and otherwise appear healthy but it may not produce flowers. These problems are generally local and may or may not be solved by the grower. I, myself, for years, have been unsuccessful in even growing Guzmania musaica in my greenhouses. This species just doesn't like our conditions, water or situation. I thought it might be altitude but when I found it growing natively in Colombia at 4,000 feet above sea level and then in another area, ten feet above sea level, I decided that elevation was not the cause. Unfortunately, I have not yet found the answer for its happiness, so far as my location is concerned, although it grows happily and flowers in St. Louis, Baltimore, Washington and New York. I have some vrieseas which I collected in Brazil eleven years ago. They continue to grow but do not increase in size nor do they bloom! As a corrective suggestion, I would say to try different potting mediums than that you are using now — different light, a new location in your greenhouse — a different procedure on watering, a different feeding mix. 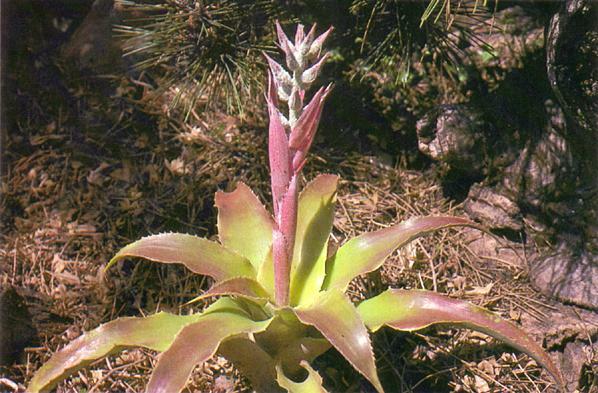 A change in any one or more of these conditions may be the reason that will bring out flowers on your bromeliads. Flowering of bromeliads can be induced in many cases by the use of certain gases and chemicals; I have been working on this problem for several years. The past winter I made a startling observation and I am hoping to be able to give some definite information on this subject in the near future, but first, certain planned experiments will have to be made. HOLD-FAST ROOTS — The question may arise, do the wiry, hold-fast roots of epiphytic bromeliads ever perform any other function than securing the plants upon their perch? Especially in the xerophytic tillandsias, with moisture-absorbing scales, are the roots required to do more than to hold on? In general, it depends on whether the roots are able to reach a moisture and food-retaining material, such as soft bark or trapped leaf mold. When this is possible they change from wire-like roots to finely branched feeding roots; in this way performing a double function. If left exposed, the roots retain their wire-like form. Both single and double function roots may be found on the same plant. It is obviously of cultural advantage to let the wire-like roots touch a suitable medium in order to change them into feeding roots as well. I was really excited when I first noticed that my Vriesea fenestralis and two plants of Vriesea gigantea were going to flower. I had cared for these plants for many years and they had become truly beautiful large plants. I had never seen either plant in bloom, so I did not know what to expect. As the photo shows, the inflorescences reach to over five feet. V. fenestralis did pup several times before it bloomed, but has not pupped since. Neither plant of V. gigantea has ever pupped, and they have been removed to my graveyard. I believe they are beyond puppies, but I will keep an eye on them. My reason for this report is to tell bromeliad growers that the beauty of these two vrieseas is in the foliage and to hope that they never flower. Neoregelia seedlings on orchid compost. About four weeks from planting. 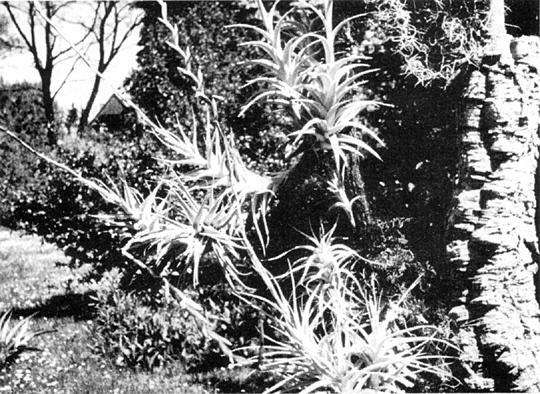 The import of bromeliad plants into Fiji was prohibited in 1960 and at that date there were about 25 species and hybrids in the country. I first became interested in bromeliads about 1972, and as the only way I can build up a collection is by growing from seed, I have been experimenting since then. Now I believe I have evolved methods which will give reasonable success under my conditions. I stress the last three words as I believe that although there are some basic points which can be set out, each and every grower must experiment to discover what is best for his conditions. I now have about 150 species and hybrids which I can say are safely established; that is, I have enough seedlings at a sufficiently advanced state to ensure that I will not lose the lot. I have another 50 species that are still at the tender seedling stage. I have killed innumerable germinated seedlings — mostly from overwatering — but my average is improving rapidly, and I feel confident enough to put on paper what I do to raise seedlings so that newcomers to growing bromeliads from seed may be able to learn something from me. Before going into detail, I think I should set out the climatic conditions in Suva where I live. Suva is wet — 120 inches of rain per year — and warm — temperature range 60 to 95°F. We are supposed to have a wet season from November to March (80 inches) and a dry season during the winter (40 inches) but without much effort it can rain four or five inches a day at any time of the year. We have had a few dry periods in the last few years and once had water rationing for a few weeks, but usually there is plenty of good water if slightly alkaline — pH 7.5. I belong to four bromeliad societies — Queensland, Australia, New Zealand, and U.S.A. and find the regular journals of these societies very helpful. There is no one else in Fiji growing bromeliads seriously so that I need all the contacts I can get and, despite the fact I am not a good correspondent, I do write to quite a number of different people. Most of my seed has come from the seed banks of the American and Australian societies, but a number of individual people have also sent me seed — to all of these good people I am most grateful. Group 1. The growing medium is an orchid compost from New Zealand and/or Australia suitable for cymbidiums, not the sort with a lot of rice husks. This is packed into plastic punnets (5½ × 3½ × 1½" deep) leaving about ¼" space at the top. This is watered heavily, and the mass settles down considerably leaving about ½" space at the top. The seeds are sprinkled lightly on top of the medium and then sprayed with a full strength solution of insecticide (usually Orthene) and fungicide (Denlate or Captan). The use of a fine spray helps to settle the seed slightly into the medium without covering them. Previously I had used a seedling or potting mix for houseplants, but I found that this encouraged the growth of fungi and algae. Group 2. The growing medium is sphagnum moss loosely packed into the same punnets. This is watered heavily but care is taken to see that it does not pack down firmly — the surface in particular being loose and uneven. Vriesea seedlings on sphagnum moss. 7 months old. 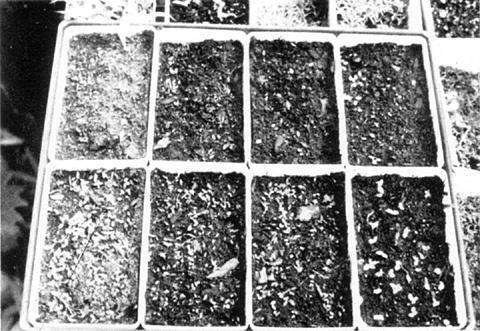 General view of seedling shelf. The seed is teased out well with tweezers and then put into the sphagnum moss. The spraying with insecticide and fungicide as above follows. Group 3. Following many experiments and many failures, I now cut lengths of hemp (not plastic) rope somewhat slimmer than my little finger. This is bound at both ends to stop fraying; the lengths vary a little depending on the amount of seed of each variety but is usually between 15" and 24". These lengths of rope are soaked well. The seed is teased out into a band about 3" wide and slightly shorter than the rope. 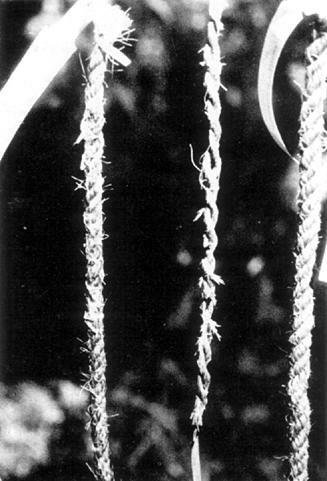 The wet rope is then rolled over the seed which adheres without any trouble. The ropes are then hung up and sprayed heavily with the insecticide/fungicide mixture. 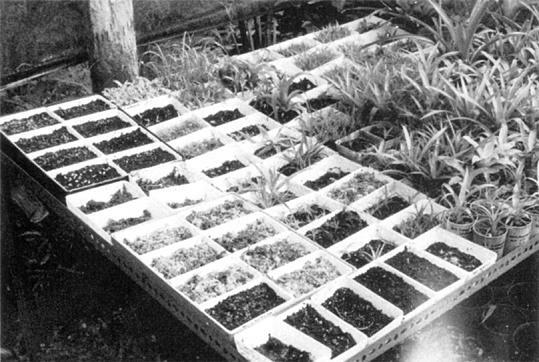 Below — Seedlings in trays. Right — Guzmania monostachia 2 years. Left — Orthophytum saxicola 10 months. The punnets go onto a bench in my orchid house, which is covered with corrugated plastic with sides of 50 percent sarlon shade cloth. The ropes are attached to a wire in the same house ensuring that plants underneath are big enough not to be affected by drips that will occur when the ropes are watered. I used to wrap the punnets in plastic but no longer do so, as it certainly encouraged the growth of algae/fungi. The punnets and ropes are watered by misting as necessary. It should be remembered that 50 percent humidity is low for us here so that the punnets may go two or three days without needing misting. The ropes are misted at least twice a day, as they dry out rapidly. The punnets and ropes are inspected twice daily with a magnifying glass to check on germination and, more importantly, to check on the growth of fungus on the seeds. Should fungus occur, the seeds are again watered with a strong fungicide. If Denlate was used for the first treatment, Captan is used for the second and vice versa. A new substitute for Benlate is coming on to the market, but it contains copper so it cannot be used for bromeliads. I have found that seed which has been stored will invariably have fungus, but fresh seed seldom has it; however, I treat all seed with fungicide. Very weak fertilizer is given occasionally to the seed on sphagnum moss and on the ropes. Those on the potting mix should not need fertilizer as it is already in the mix. Snails and slugs are occasionally a problem, but metaldehyde snail bait usually gets rid of these. Regular checks for these pests is necessary, as they can wreck havoc in a very short time if not found and destroyed. Very occasionally a caterpillar will do quite a lot of damage; firm pressure between the thumb and finger is the best medicine for this. June 21 and 22 — The Sacramento Bromeliad Society will hold its annual show and sale at the Shepard Garden and Art Center. It will include floral arrangements, exhibits of specimens, examples of terraria, mobiles, trees, and demonstrations on how to grow bromeliads. June 26 and 27 — The Ballona Valley Bromeliad Society invites all members to their annual show and sale, which will be held at the Veterans Memorial Building in Culver City (a suburb of Los Angeles). Hours are from noon to 5:30 on Saturday and from 10 to 5:30 on Sunday. Bromeliads provide a pleasant addition to our garden. Many are equally at home whether attached to an oak tree or growing on the ground at its base where they make an excellent ground cover. Few other plants thrive under the severe competition from tree roots. A few tolerate a wide range of soils and light conditions, but many require shade and a fast-draining soil. The greatest success has been obtained by watering lightly but frequently. A rainbird sprinkler high in the oak tree creates a wide circle and is used to substitute for rainfall. 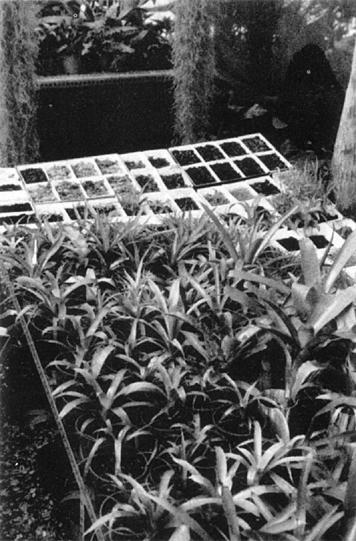 Young bromeliads are grown in pots and pushed to near-maturity by foliar applications of a liquid fertilizer (alternate 20-20-20 and 15-7-7 with minor elements). Blooming at this time (July 1979) are: AECHMEA aquilega, bracteata, × Burgundy, cylindrata, distichantha, fasciata, × Foster's Favorite, fulgens, lueddemanniana, × Maginali, mulfordii, × Royal Wine; ANANAS bracteatus; GUZMANIA lingulata var. cardinalis; HOHENBERGIA stellata, NEOREGELIA carolinae; NIDULARIUM innocentii var. innocentii, regelioides; PORTEA petropolitana var. extensa; and VRIESEA × Mariae. AECHMEA: aquilega, bracteata, × Burgundy, calyculata, caudata, chlorophylla, comata, cylindrata, distichantha, fasciata, × Foster's Favorite, fulgens, lueddemanniana, × Maginali, miniata, × Minical, mulfordii, nudicaulis, orlandiana, pineliana, recurvata, × Royal Wine, triticina, weilbachii. 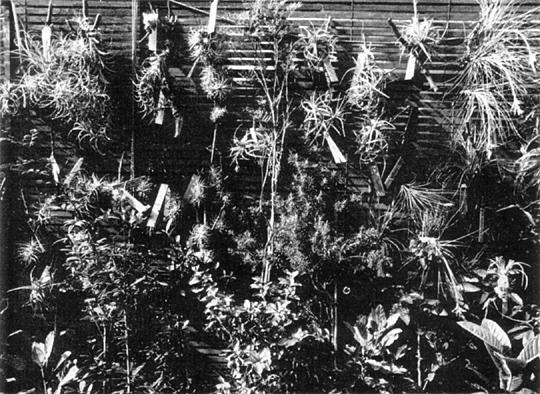 BILLBERGIA: × Catherine Wilson, × Fantasia, × Gerda, leptopoda, × Muriel Waterman, pyramidalis, × Santa Barbara, venezuelana. CANISTRUM: bromelioides tricolor, × Cascade, × It, rosea picta. NEOREGELIA: ampullacea, × Avalon, carolinae, farinosa, × Fireball, fosteriana, macrosepala, marcon, × MarFos, marmorata, spectabilis. NIDULARIUM: × Chantrieri, innocentii, procerum, regelioides. VRIESEA: carinata, malzinei, × Mariae, × Retroflexa. 3. geographical location. (Example, our plants sometimes receive damage when those in the downtown area do not — and vice versa). When you receive this issue, the Bromeliad Society of Central Florida will be putting on the final touches to its show and conference to be held at the Sheraton-Twin Towers in Orlando, Florida, on May 2 — 4. Situated as it is in the midst of Disney World and other tourist attractions, the hotel is the ideal place to attract visitors from far and near. Besides viewing a magnificent show, they will be able to avail themselves of many activities which the area has to offer. 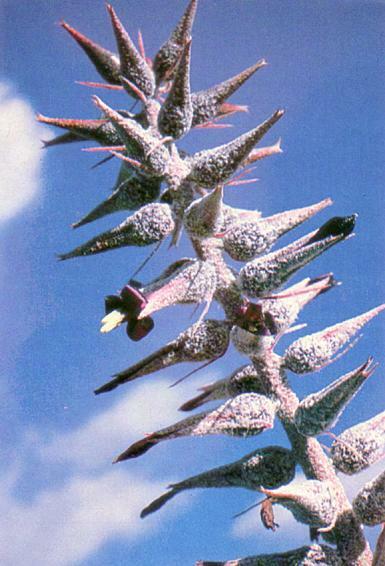 Hardly a week goes by that the editor does not receive an inquiry as to where this dyckia may be obtained. So far as she knows, it is not in the trade, and to the best of her knowledge the only plants in the United States are offspring of that sent to David Barry by Julien Marnier-Lapostolle some years ago. There are specimens in several of the botanical gardens in Germany. It is an unusual, but extremely beautiful, dyckia; its thick, succulent leaves completely covered with cinerous scales and edged with prominent curved spines, are unlike those of any other member of the genus. The illustration is that of a young plant — a mature specimen measuring 10 to 12 inches across. This dyckia was originally discovered growing in rock crevices at elevations of around 3,700 feet in Goias, Brazil, and was sent to M. Marnier-Lapostolle, who first cultivated it. The pretty, appealing "earth stars" are always worth mentioning again. They are such good house plants that we never cease enjoying them. In their favor also is the fact that they have easy cultural requirements, and they also grow well in shady spots in our living rooms. They got their name from the deep-set, sessile flowers: cryptos = hidden; anthos = flower. This genus comes from Eastern Brazil, especially from the areas of Pernambuco, Espirito Santo and Bahia. Cryptanthus are endemic there; that is, originally they were found only there. They are groundcover plants in forests but are also found in sunny locations. A few species definitely prefer full sun. They are terrestrial and form many roots in the loamy forest ground. One often sees them in flower shops as epiphytes on branches or tree roots, which does look nice, but which is alien to the plants. As epiphytes they lead a miserable existence; they prefer to grow in a pot or in a dish in a humusy medium. For the hobbyist with a window sill garden they are best grown this way. Almost all the species have flat leaf rosettes in many splendid color variations: brownish red, pink, yellow striped, green with white, gray or yellow spots, red with dark and light stripes, even silver tones are found and a strong red will appear under good light conditions. The ability of cryptanthus to send out many pups from their leaf axils is a joy to the grower. Their growth under optimal conditions is almost fast. Terraria can be planted beautifully with these earth stars; they find perfect conditions in glass cases and closed window greenhouses. But even culture on a window sill under the simplest conditions can bring good results, and a well grown cryptanthus, possibly even blooming, is a very nice table decoration for many occasions. They like to be kept warm! Short periods of low temperatures will hardly be noticed, however. Sufficient humidity and liquid fertilizer in regular feedings will also please the plants. The old claim that they can stand some neglect is true — just refrain from looking at them for a few days and perhaps they will bloom. The flowers are also like stars. They open completely and are white in all species. If you want to get seed on them or possibly make your own crosses, you should observe a certain peculiarity of cryptanthus: the first flowers to appear on the inflorescence are usually equipped with only stamens and have no pistil. The female flowers do not appear until later in the flower axils. Thus, for seed set, it is good to have several plants blooming at once. You can hardly see the seed capsules. Special attention is required in order not to miss the right period of maturity. 10 to 12 green distinctly wavy leaves in a flat rosette; a small plant of about 15 cm diameter. Silvery scales on the upper side of the leaves, shiny in strong light. Becomes brownish red in good light. Doubly striped leaves, green with two distinct cream colored or pink longitudinal stripes. Commonly grown and easily cultivated. Underside of the leaves are reddish brown; upper side pink to red. Thick green bush up to 30 cm high. Forms many pups. Yellow longitudinal stripes on all leaves, overlaid with red under optimal light conditions. A rather tall, very desirable house plant. One of the most beautiful species. Leaves deep brownish red with cross bars of gray scales. A large plant; under good care it can reach a diameter of 60 cm. Leaves succulent and distinctly wavy. Very pretty rosette to be grown only where space is sufficient. Similar to the preceding species but smaller. Leaves thinner and greener with strong, silvery cross banding. The long, white flowers are striking. They stand in a pretty tuft in the center of the rosette. A silvery central stripe accents the green, dark leaves of this little plant. Additionally they often have gray or silver-gray, distinctly fluted leaf edges. Very pretty in groupings with reddish brown species. In the cryptanthus family there are some very attractive hybrids, varieties and new forms. In the last ten years some especially beautiful stars have been added to the long known forms such as C. makoyanus (acaulis × bivittatus), C. osyanus (lacerdae × beuckeri) and C. mirabilis (beuckeri × osyanus), the latter made by Mr. Richter from Crimmitschau, East Germany. The new forms come from the USA and nearly put the others to shame. "It" and the quite similar "Starlite" are very brilliant and beautiful. Also "Carneval de Rio," which is not very prolific but has leaves of glowing color: red with green spots. These new earth stars are surely a bonus to any collection, but in my opinion the natural species are often just as beautiful and hardier. They are easily grown on a window sill and are satisfied with a semi-shady spot. At bloom time all of these plants with their white star-shaped flowers in the centers of the colorful rosettes are an especially beautiful sight. 'TWAS EVER THUS — For the past thirty years the Journal of the Bromeliad Society has endeavored to keep alive an ever growing interest in this great plant family. Our purpose has been to inform and encourage a greater understanding and appreciation among the members of the Society who live in many countries. Although the job of being an editor is a pleasurable one, it is definitely also very painful, for the lack of material is indeed frustrating. 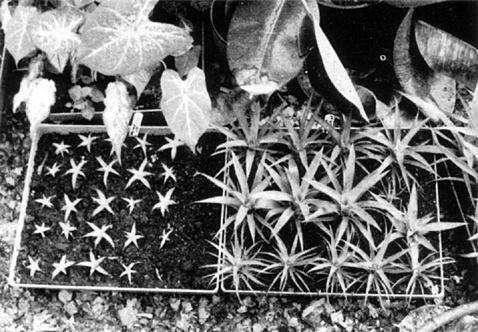 In 1956 Mulford Foster had the same problem when he wrote: "The Bromeliad Bulletin seems to roll along in spite of all the odds against us in putting it together. There are times when we do not see how we will have enough material for another issue. This is the situation which confronts the present editor. She would welcome knowing about your experiences and about your collecting trips. Again to quote Mr. Foster, "It is always a happy day when we can see with certainty the publication of the next few issues of this periodical dedicated to the preservation of knowledge of the Bromeliaceae, a plant family without equal in its extensive variety of interest." A CULTURAL HINT — If you want to get long, strong roots, put your bromeliads in pure German peat. That material is acid but contains no fertilizing substances. After the plants have developed roots they must be fertilized regularly. I have noted that old dead wood that has been used for years in the humidity of a greenhouse becomes useless for epiphytic plants. I think that the old wood must lose its natural acidity and therefore the plants refuse to make roots. If you take plants that have been growing on an old piece of wood and attach them to a fresh limb, they will almost at once make a lot of new roots. Rainwater has always been the standard of excellence by which water quality has been measured. Many growers collect rainwater in barrels and use it exclusively for watering their bromeliads. Recent research, however, indicates that the rain that falls upon our North American homes is not quite the same as that which drenches the Brazilian rainforest. As an article in the October, 1979, issue of Scientific American' reports on the trend in rainwater quality over the past several decades. Most rain and snow today are really dilute solutions of sulfuric and nitric acids. The culprit seems to be fossil (coal) burning power and industrial plants. The sulfur and nitrogen oxides released into the air are oxidized and hydrolyzed in the atmosphere into sulfuric and nitric acids. What was previously a local problem quickly became a regional one, as exhaust stacks were built taller and taller to reduce sulfur and nitrogen oxides near the ground where EPA makes its pollution measurements. Unfortunately, this problem is not confined to the Industrial Northeast. Autos are also a major contributor of nitrogen oxides, so most metropolitan cities have acid rain. The problem is most severe in Europe. Scandinavian countries claim that thousands of lakes "once teeming with fish" are now lifeless, and forest and farm crops are being seriously affected. Acidity is measured by means of the pH scale. The scale is from 0-14 units with 0 being very acid, 7 neutral, and 14 very basic. The scale is logarithmic, which means pH 5 is 10 times more acidic than pH 6 and pH 4 is 100 times stronger. The pH of rainwater has always been slightly acidic due to naturally occurring acid forming materials such as carbon dioxide. However, many measurements of rainwater today indicate typical values of pH 2-5. There are no documented cases of acid rain damage to bromeliads. Acid rain has been suggested as the possible culprit when one southern California grower experienced center rot during the winter months. The effect on your beautiful plants is also likely to be minimal, but it is a situation which should be watched since EPA estimates indicate it will get worse as more utilities revert back to burning coal because of the energy crisis. 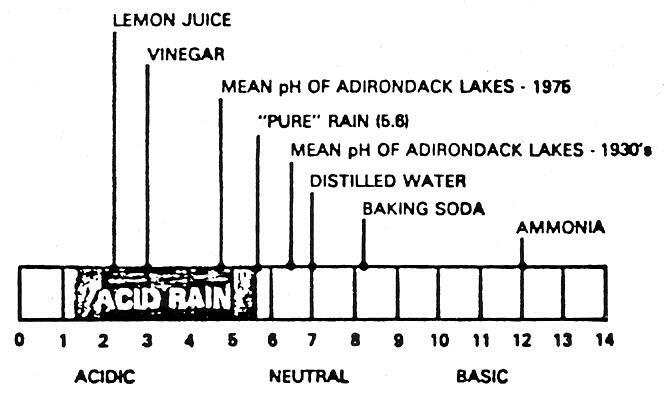 I know of people who add vinegar to the tap water to lower the pH, but it's going to be a lot tougher adding baking soda (sodium carbonate) to the rain! 1. Likens, Gene F., et al, Scientific American, Vol. 241 (4), Oct. 1979, "Acid Rain." 2. EPA Research Summary, "Acid Rain" EPA-660/9-79-036. Bromeliads seem to do better, especially to reproduce better, if they are set deeply into the potting material, so lower leaves disintegrate and the stem is exposed by the removal of these leaves. Bromeliads do not seem to make good growth if any restricting device, such as wire, cord, or rope crosses the lower leaf area. If fastening bromels to bark, tree trunks, etc., it is best to fasten the restricting band just at the point of junction of roots and rhizome-like base of plant. Old outer leaves are removed, not only for the sake of appearance of bromeliad plants, but also to encourage the development of pups or offshoots. Use non-fat dry milk in solution to clean leaves of plants. Clean and sterilize pots before re-using. 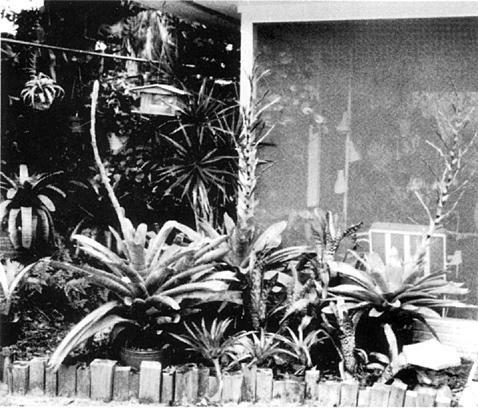 CHARTER MEMBERS — The Bromeliad Society had its beginnings in 1950, the total membership at the end of the year numbering 46 hardy souls who had sufficient faith in the fledgling organization to give it every support. Of that number only nine have kept up their membership and we salute them for their confidence in us. They are: W. T. Drysdale, Wilbur G. Wood, Myron Kimnach, Victoria Padilla — All from California; Dr. Russell J. Seibert, Racine Foster and Bert Foster of Florida; The Missouri Botanic Gardens, and Alfred B. Graf of New Jersey. At the meeting of the Board of Directors held in Los Angeles on January 27, it was voted unanimously to name Mr. W. W. G. Moir of Honolulu, Hawaii, as an Honorary Trustee for the work he has done with bromeliads. His beautiful garden has been a source of inspiration to all those who have visited him. He is certainly the one person responsible for the great popularity bromeliads are now experiencing on the Islands. 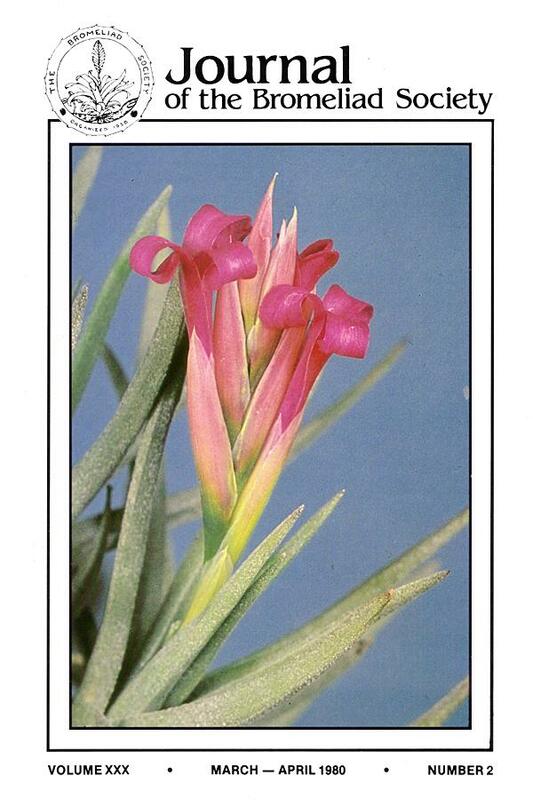 Tillandsia rosea, as we all know, is an extremely rare plant, which recently has become unknown in its native habitat. We must therefore assume that it is extinct in nature. A T. rosea bloomed in my collection in January 1977. In the spring the plant produced one pup. Since I had already had good luck with a T. kammii, I decided to try to remove the pup from T. rosea also, since this plant normally produces only one pup. But it was more easily said than done. It was impossible to get at the pup with a sharp knife, because T rosea pups in the upper third of the plant, not at the base. But since this plant has very dense leaves and a common knife is a much too crude tool, I came upon the idea of using a scalpel. My daughter was working for a dentist at the time and brought me one from work. With the scalpel I separated the first pup and glued it to a grape stalk. It was about 1.5 cm tall. But unfortunately it did not grow. The second time I just tied a pup to a stalk, but even with this method it did not grow. After the third unsuccessful attempt the mother plant suddenly produced 3 pups at once. Since I was accustomed to examining the plant every day, one day I found myself holding the detached inflorescence with a few leaves. But between the leaves was one more pup of about 1 mm in size. I tied the detached tuft just as it was to a piece of grape wood. The leaves dried gradually and finally there was only one leaf with the little pup. The old plant with the 3 pups now had only 2/3 of its original size. In an attempt to get more pups, I cut the rest of the plant in two. The three pups on the upper half of the separated plant thrived. The stump of the plant produced one more pup, which through my negligence unfortunately died: I tried to divide the plant once more. The rest of the plant died soon along with the pup. So I ended up with 4 pups from a single plant and am quite satisfied with my first efforts at propagation of T. rosea. With my next attempts I will surely get even more pups. It would be nice if my efforts with T. rosea would contribute to its preservation. In the long run the one pup which the plant normally produces is insufficient for the preservation of the species.